Just nine chapters after this prophecy was given to Hagar, we find the following historical record of Ishmael and his descendants. The Muslims, who hate America and seek to destroy Christianity, come by their hostile nature “honestly.” Islam is based upon the teachings of Muhammad, the man who claimed Abrahamic descent through Ishmael. By claiming such a lineage, Muhammad must also claim responsibility for the prophecy about his people. History is littered with evidence of the fulfillment of this prophecy. Twice in modern history, the forces of Islam have tried to conquer the Western world by military force. In 710 A.D., Islamic militants crossed over the Straits of Gibraltar and conquered much of Spain and Portugal. They then proceeded to take one-third of France before they were defeated in the Battle of Tours, only 125 miles outside Paris. A little over 900 years later, the Turks began expanding their Ottoman Empire and conquered all of the Baltic nations before their troops reached the gates of Vienna in 1683. Sadly, the average American is more familiar today with the Muslim culture than they ever dreamed of being prior to the attack of September 11. That horrible day of carnage and destruction may very well be looked back upon as the most productive public relations event in Muslim history. Muhammad was born around 570 A.D. in Mecca. He was raised by his uncle and worked on caravans. At age 25, he married a wealthy woman who was 15 years older than he. At age 40, Muhammad decided that he had been called by Allah to be his prophet. Muhammad spent weeks at a time in a cave on Mt. Hira, where he claimed to receive messages from the angel, Gabriel. In one such encounter, Muhammad claimed to have been transported to Jerusalem and, from there, ascended into Heaven to talk with God. These claims made him unpopular with many, especially the Jews. On September 24, 622 A.D., Muhammad escaped an assassination attempt by Meccan leaders. He and his followers fled to Medina, the second holiest city of the Muslims. While in Medina, Muhammad made several concessions in an attempt to win Jewish support. In Medina, Muhammad was faced with a growing need to support his followers. Muhammad produced revelation to support the raiding of caravans. (Qur’an 22:39-40) This re-energized his movement and gave his followers justification for violence toward their enemies and thievery for survival. Muhammad himself led at least three such raids. In January 630 A.D., Muhammad and ten thousand men invaded Mecca. They conquered the city with virtually no resistance. The conquest of his beloved hometown gave his movement new momentum. He soon conquered all of the Arabian Peninsula and eventually reached as far north as Syria. In March 632 A.D., Muhammad led his last pilgrimage to Mecca and delivered his farewell address to tens of thousands of his followers. On his return trip to Medina, Muhammad fell ill. On June 8, 632 A.D., he died of sudden but natural causes. Before dying at the age of 63, Muhammad had delivered numerous speeches about the laws and the philosophies that he believed should govern his new religion. These teachings of Muhammad are found in a book called Qur’an. Six other volumes, called the Hadith, supplement the Qur’an with accounts of the life and teachings of Muhammad. Ironically, Muhammad’s heavy emphasis on biblical accounts was one of his biggest mistakes. Perhaps the most damaging evidence that the Qur’an was not inspired by God is the numerous mistakes Muhammad made about biblical names, events, and chronology. Q: Where did Muhammad get his information? A: On long caravan trips across the desert, Jewish, Christian and pagan traders would meet around the campfire in the evening and share their favorite stories. Muhammad listened with wide eyes but over time got names, chronology, and events jumbled and confused. Consider the following quote. Conclusion: Either Muhammad was not inspired or the Bible and history are in error. How did Islam originate? It came from the heart of Muhammad not the heart of Jehovah. Re-prioritize the study of God’s Word, the importance of the church family, and loyalty to Christ at all cost. This foundation of faith and a spiritual support group will be essential to your family’s survival in days to come. Start now by making family devotionals and church activities mandatory, non-negotiable, and a top priority. Equip your family to make the most of coming conditions. It is a harsh new world. Those with the most knowledge of basic life skills will also have the most opportunity for evangelism. Fathers, teach your sons how to hunt, fish, and raise their own meat. Teach them basic electrical, plumbing and carpentry skills. As persecution heightens, these skills will be in great demand. The evangelistic opportunities to help others and, in the process, introduce them to Christ will also be at a premium. Mothers, teach your daughters to sew, garden, preserve food, and cook from scratch. As the need for basic survival skills increases, so will the opportunities for Christians to serve and, thereby, show others the love of Christ. Americans have grown complacent. Many of the skills taught today will have little or no value in the future. The wisest of us all are those who are alert to the coming danger and have already started preparing for both physical and spiritual survival. Will Islam Be America’s Babylon? God’s prophecy of a great and violent nation coming from Ishmael continues to come true even within our very own time. Wake up America! The conquering Babylon has again encircled a nation that once honored God. Men like Jeremiah are again warning God’s people of impending doom unless we repent. Q: What will you do with God’s prophetic warning? Missed the Introductory lesson of this series? Take a look! "Preparing for Islam: Do We Worship the Same God?"" 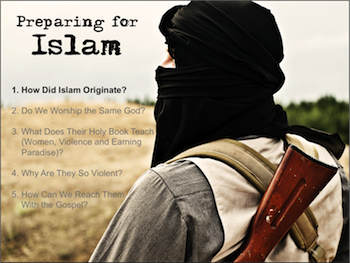 "Preparing for Islam: What Does Their Holy Book Teach? (Part 1)"
"Preparing for Islam: What Does Their Holy Book Teach? (Part 2)"
"Preparing for Islam: Why Are They So Violent?" "How Can We Reach Them With the Gospel? (Part 1)"
"How Can We Reach Them With the Gospel? (Part 2)"
"How Can We Reach Them With the Gospel? (Part 3)"
Back to Top of "How did Islam originate?"